Is there a better alternative to myFMbutler PrinterSwitch? Is myFMbutler PrinterSwitch really the best app in Applications category? Will myFMbutler PrinterSwitch work good on macOS 10.13.4? 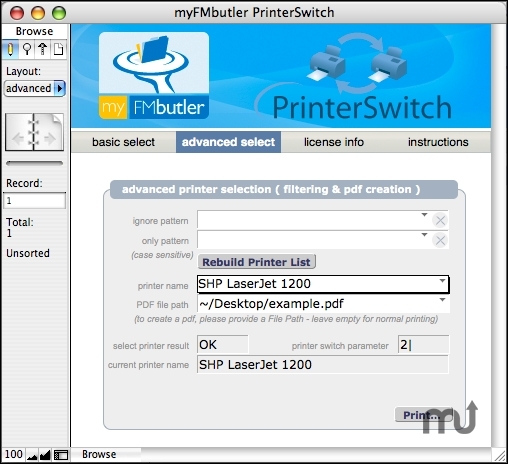 myFMbutler PrinterSwitch is a FileMaker 12 plug-in (also supports 11, 10 and 9) that allows you to easily control printer switching from within your FileMaker solutions. It also allows automatic dynamic PDF creation from within FileMaker. myFMbutler PrinterSwitch needs a rating. Be the first to rate this app and get the discussion started!